Protected by Long Island from Atlantic surf, Connecticut's beaches have little surf and warmer water than those of other New England states. Once reserved for residents of exclusive Greenwich CT, this pretty beach and forested park is now open to all. Lots of room to swim and walk here and in adjacent Shady Beach Park and Taylor Farm Park, south of East Norwalk CT.
On the shore of Westport CT, this sprawling 234-acre (95-hectare) park has wetlands and woods as well as beaches with bands of colored sand. Fairfield CT has a fine town beach with recently-renovated facilities including a children's playground, toilets, locker rooms and snack stands. Perhaps Connecticut's longest, most magnificent beach! 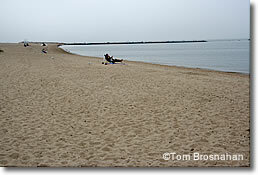 Hammonasset Beach in Madison CT is big enough for everyone to spread out.